Heartbreaks last as long as you want and cut as deep as you allow them to go. The challenge is not how to survive heartbreaks but to learn from them. Love hurts when you break up with someone. It hurts even more when someone breaks up with you. But love hurts the most when the person you love has no idea how you feel. Love is like a butterfly. The more you chase it, the more it eludes you. I know, believe me, trust me cause I've been there. But if you just let it fly, it will come to you when you least expect it. Love can make you happy but often it hurts, but love's only special when you give it to someone who is really worth it. So take your time and choose the best. As for me, I'm just waiting for the right time for everything to falls in place. Soon, there will be more of me and you, you and I, us :) Thanx for making me feel wanted in this world. I wish I can tell you how I feel but let's not rush things shall we? Let's enjoy the breeze and watch it happen cause I know, you and I, me and you, us is for real. carynn........ thanx for clubbin with me last nite babe. I had fun! love?? love is in the air.. juz like the wind..
tp cnta sejati x kn dtag mcm 2 jew..
u hev 2 find it, chase it, n once u got it, u must keep it deeply in ur heart..
L to the E to the VE..!! 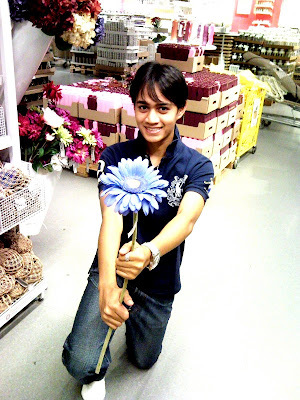 You look so adorable with the flower aiman. If you keep to the same pose when u propose to a girl. GUARANTEE Success ! thanx, i think the same way too. love is like a wind, you cant touch it but you can feel it. lol ure so interesting u know that? you lied to me. you can write so well. you write even better than me. i dont have nothing much to comment on this entry, except that i am happy to know that u're trying to accept someone in your life. if time that you needed, then i am pretty sure that the one who wants you, will wait for it. Written by Aiman Ariffin. Picture Window theme. Powered by Blogger.